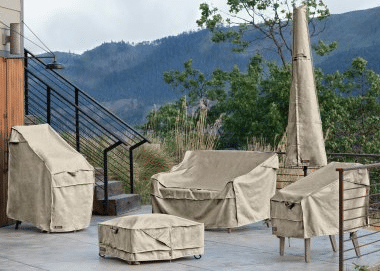 When looking for options to protect your patio furniture, these four options of outdoor patio furniture covers from Walmart.com will give you what you want. I will give you the details of each type of cover, the materials and what types of furniture it will protect. Now lets compare these products to see what will work best for you. This sand colored woven polyester material is the cheapest at a starting price of under $10. If you are looking for the most inexpensive cover, this collection will be what you are looking for. Over 40 styles are available. An elastic cord will keep your cover secure on the furniture. A simple vent will help with lofting and moisture on the inside of the cover. Loops that are sewn in go around legs for extra security of cover. They do not open and you must lift furniture to attach. This is a premium patio furniture cover comes in over 140 different sizes to fit almost any thing you want to cover outside. Starting in the $20 range and going up according to the size of what you need to cover. The fabric is several different styles for protection. The fabric is Gardelle woven polyester material. The top is a water resistant fabric with a water proof backing. The darker skirt is made with a splash proof material to keep the water from coming up when it rains. This is helped by having a draw string to keep it tight against the legs, buckles help you strap your cover to your furniture. The wind will not blow this cover off. There will be vents on the sides to let your furniture breath when covered. Sewn in handles will let you remove your cover without too much trouble. Cleaning is simple and only a soft brush and warm water is recommended. Any soap is not recommended as it may damage the water resistant protection, only air dry when the cover gets wet. This collection is the best value for your money. This collection has over 100 styles to choose from. Prices start at just over $20 for this collection. The darker espresso color will give a modern design to your outdoor space. The Gardelle woven polyester fabric is backed with a water proof material with double stitching. Vents are made to let moisture escape and to keep the cover from lifting from the furniture. A mesh backing on the vents will help keep out pest and debris from coming in the vents. Reinforced handles will have double stitched seams to help with durability. Hemp drawstrings in a double stitched channel will help keep cover tight on furniture. Straps are also included to help keep cover secure. If the darker color is what you are looking for, this collection is for you. The beige fade resistant fabric is backed by a water proof material to help keep your furniture dry. This premium collection is available in more than 20 styles that start at a little over $40. This collection will give you the option of getting chair covers in sets. This will give you the ability to have matching covers for all of your chairs. Includes sewn in handles for easy removal of cover when not needed. Vents will help moisture escape. Draw string on the bottom will help keep your cover secure in the windy conditions. Click tight straps will also secure your cover to your furniture. A storage bag is also available in this collection. This is the most expensive of the covers, it is the thickest material and will last longer. If you are looking for a way to protect you investment in patio furniture, one of these outdoor patio furniture covers from Walmart.com will give you what you are looking for. If you are looking for the cheapest, the Terrazzo collection will work. The others have a little more options and protection and are a little higher in price. If you are looking for a color to match your outdoor decor, I have given you the color combinations available. For other cover options look at my other article here that I wrote two years ago. If you have any questions or comments, use the forms below. What a great idea for a website. I have always wanted a hanging chair, but no where to put it. I live in an apartment so may be a bit hard to find a spot to hang it. Great ideas here. Thank you for sharing. Thanks for looking around my site. Having a hanging chair is a great space saver. You can get the benefits of a swing and a chair at the same time. 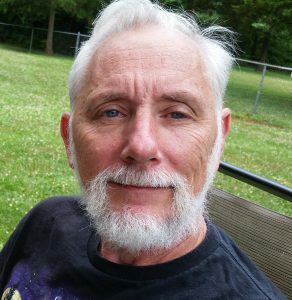 An amazing article with a lot of useful information and ides. I am looking forward to try some of them. Having outdoor furniture that you have to store indoors or find storage for the cushions when not needed is a pain. The furniture covers in this article will allow you to use your furniture will little care. I have such a love and hate relationship with outdoor furniture! Lol I love having it but can’t stand the way they get all nasty with time. Having these covers would hopefully help me preserve my outdoor furniture a little longer. Thanks for your detail info! 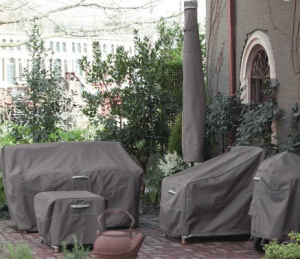 Having a cover will extend the life of your outdoor furniture without much care. These covers are designed to withstand most conditions outdoors and let you use your furniture without much care.